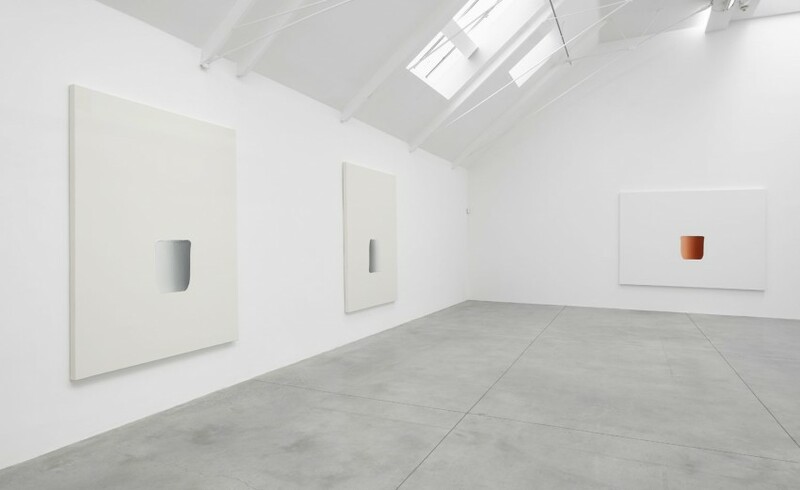 Lisson Gallery is currently presenting a new body of work by Lee Ufan, the influential artist who first gained recognition within the avant-garde art movement Mono-ha (School of Things) during the 1960’s. Considerably less known and understood in the West, Mono-ha emerged in Japan as a response to Eurocentric notions of representational and descriptive art making, focusing instead on the dialogue between nature and material. Ufan, who started his career as a professor and art critic, stands out as an influential figure from the movement with his visually serene yet intellectually intriguing works, often harmonizing sculpture with works on canvas. The selection at Lisson Gallery includes some of Ufan’s ongoing Dialogue paintings that stem from his emphasis on concentration, patience and repetition, features that are tightly knit to the Mono-ha school. Positioned in the center of calmingly white canvases, meticulously arranged brushstrokes in strikingly warm colors such as red, green or blue articulate Ufan’s artistic approach: modest figurative juxtapositions accentuated by vigorous physical gestures. Simultaneously intervening and merging with the purity of the canvas, color intrusions are results of leisurely hand gestures, allowing color pigments to build up on the surface. Gradually piling up on Ufan’s canvas, bright tones of red, blue or green eventually orchestrate simple visuals that do not easily reveal their steady production method. 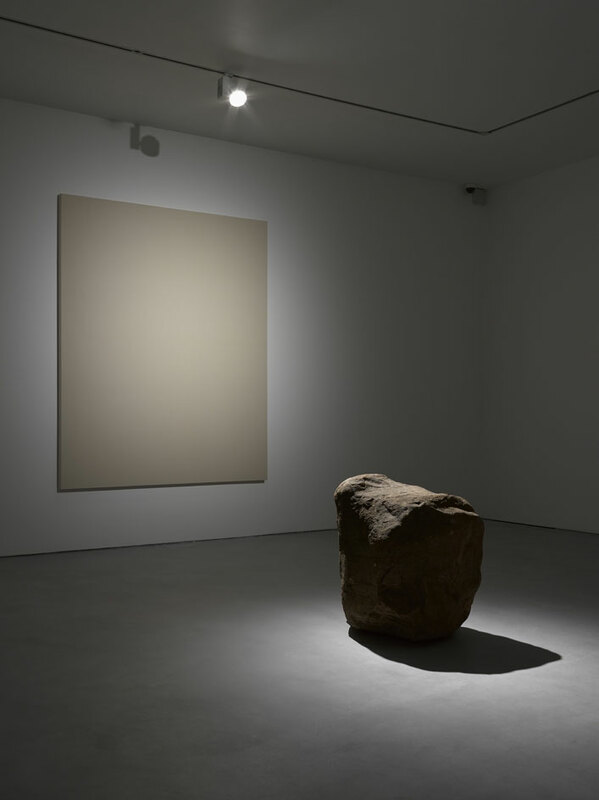 Ufan, whose minimalist compositions gained even a sharper language in contrast to the flamboyant architecture of Palace of Versailles in 2014, balances three-dimensionality with surface in Dialogue – Silence, placing a found stone in conversation with a virgin canvas. Sharpened by a dramatic illumination effect, the installation delivers a tranquil and thought-provoking experience, emerging from the simplicity of its creation method that contrasts with the fastidiousness of other Dialogue paintings. The shape of the rock indicates towards the painting, but asks little of it beyond that initial gesture, almost questioning its own exchange with the other work in the space. 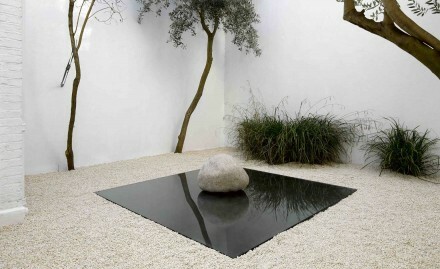 A similar work, Relatum – Rest, waits outside in the courtyard, an arrangement of another found stone installed on a sheet of glass, and lying on a bed of white marble chips. The rigidness of the stone, fragility of the glass surface and the magnitude of marble chips calmly integrate each other into their own material demands, readjusting Ufan’s typical economical narrative. The minimalism of Ufan’s sculptures and paintings here lacks the sense of effortlessness that Western schools of minimalism often put forth as an essential element of their rendering. Ufan’s work is unceasingly patient in its execution, and its strength comes from its ability to transpose that patience to the viewer. Long viewings of the works slowly unfold the numerous brushstrokes that the artist made in executing the final product, and his sculptural intrusions perhaps require just as much consideration in their placement and formal alignments as the artist did in placing them. These labor-intensive studies into space and time give the work an interiority rarely seen in such sparse pieces, and make the experience of viewing Ufan’s work all the more rewarding. 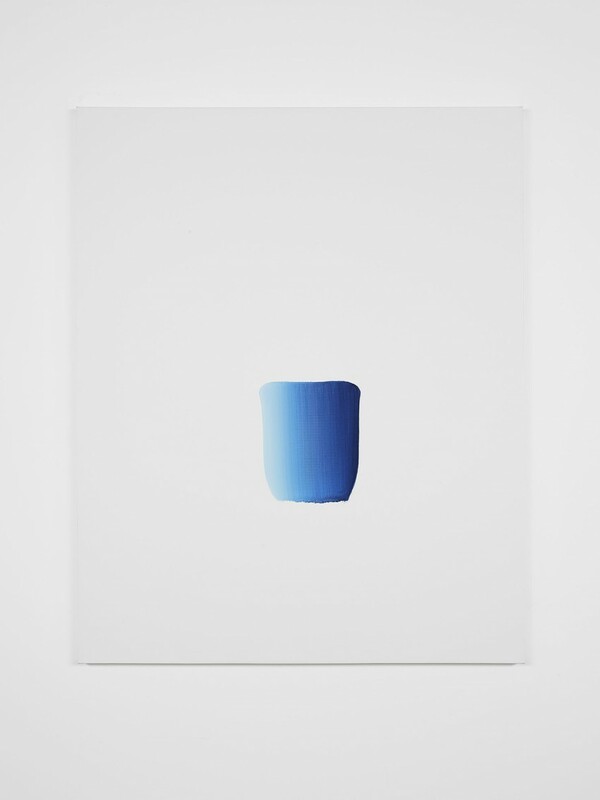 Lee Ufan Is On View at Lisson Gallery Through May 9th, 2015. *All images are the Courtesy of Lisson Gallery, London. 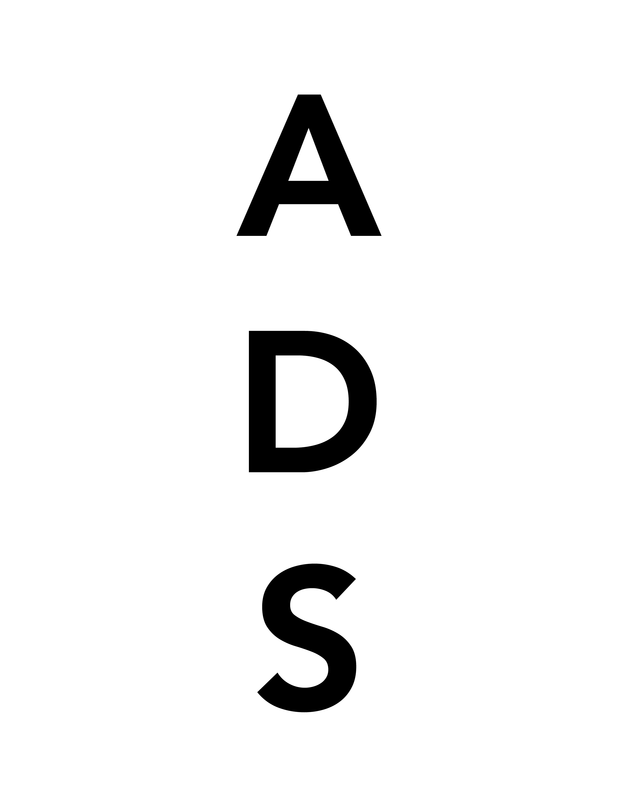 This entry was posted on Friday, April 17th, 2015 at 11:45 pm	and is filed under Art News, Featured Post, Show. You can follow any responses to this entry through the RSS 2.0 feed. You can leave a response, or trackback from your own site.